My Recent Trip to Austin and the #1 Reason I Can’t Wait to go Back! A couple months back, my husband and I were planning to travel to California for a little weekend getaway. But after some plans fell through, we still wanted to go somewhere pretty close, warm, with good food. And well, that was easy – Austin. Austin is one of my favorite places to travel to. It has cool neighborhoods, live music, good food, and you can get to the lake within minutes. I’ve been to Austin probably 5 different times and I’m constantly impressed by the food and the people every time I’m there. So we booked a trip with another couple and went straight for drinks, food, and some friends along the way. My husband hasn’t really experience Austin so I was SO excited to show him around and take him to some of my favorite restaurants that I hit up every time. But I have to mention it…I was a little disappointed in a few of my favorite places this trip!! I was so sad because I talked it up and bragged so much to my husband about these places and then they weren’t that impressive. Maybe my hopes were too high. BUT luckily there was one place that made up for everything and it’s the main reason I CANNOT WAIT to go back. But I’ll get to that! Let’s first talk about the where we stayed! When we were deciding on a hotel vs a rental, we decided to rent a VRBO so we could have our own space, living room, and kitchen to all hang out in. I found this upscale loft that had 2 bedrooms, 2 bathrooms, and plenty of open space that also overlooked downtown. This apartment was super comfortable and I loved the decor BUT it was definitely in a part of town that’s still changing. Construction was going on at all hours and there was a ton of people loitering around, which didn’t make it feel like the safest place. Plus it wasn’t exactly walkable to much, so we ended up taking an Uber or Lyft whenever we wanted to go anywhere since we knew we would have drinks at night. So even though I would recommend this loft because it was super cute and secure, I will definitely find something closer to more walkable areas next time. 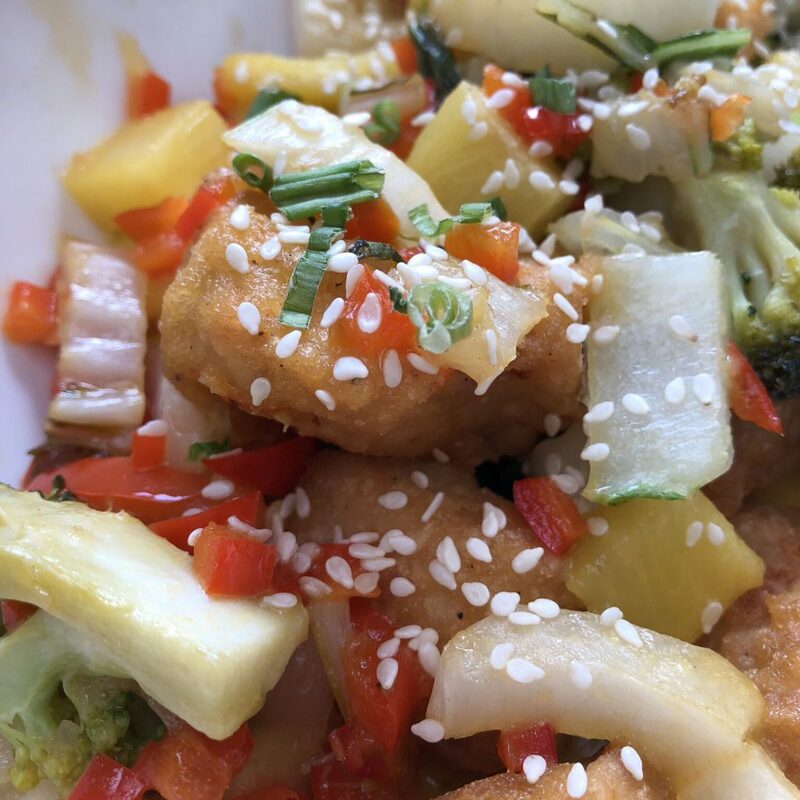 As soon as we landed in Austin, I took my husband straight to one of my favorite restaurants there – Picnik to meet some of my amazing friends of Siete Foods! Picnik started in a little shipping container then they opened up their brick and mortar a few years ago. They offer A TON of paleo options and everything is gluten free. Plus they serve food all day including brunch items and AHHHHMAZING coffee. They are really known for their coffee and their iced mocha with coffee, butter, met oil, raw cacao, maple syrup, and whey protein is LEGIT. I always drink it so fast then instantly want another and end up not eating much of my meal. But if you are ever at Picnik, you absolutely have to get a blondie. It will be the best blondie you will ever eat, I promise you that. Also, get two. Don’t be dumb. After driving around and exploring the city then meeting up with our friends, we had our first dinner together at Fresa’s. I tried this restaurant with the whole group of Siete Foods last time I was in Austin and loved it so much that I wanted to take everyone to it for the first night aka margaritas night. And Fresa’s has some damn good margaritas. Last time I was there, I ordered a few tacos in a bowl instead of a tortilla, but this time I went to bowl route and ordered the Power Bol. 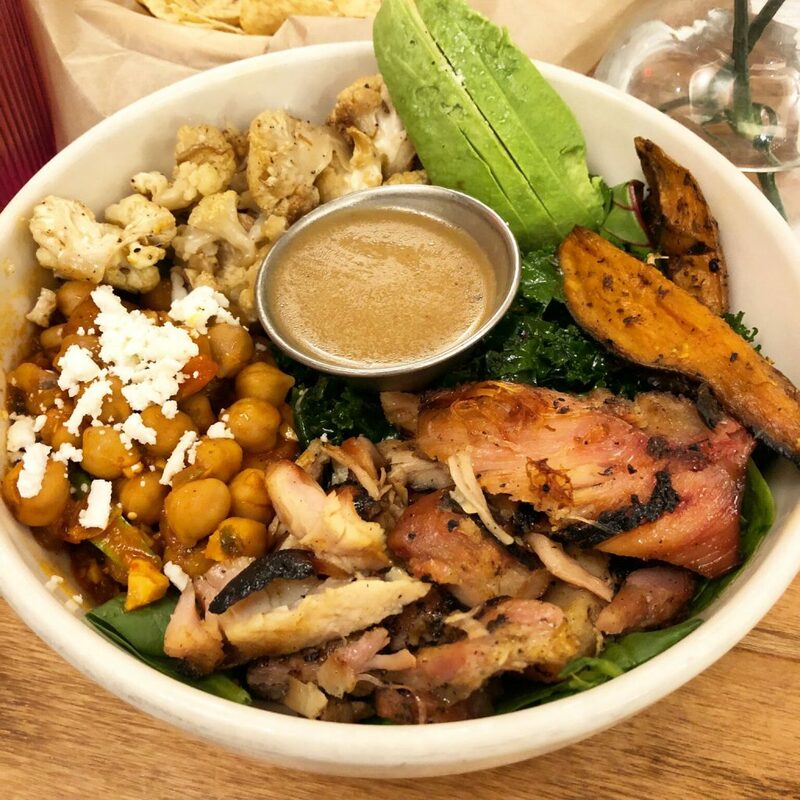 It has Agave-Lime Chicken, Power Greens, Avocado, Adobo Chickpeas, Roasted Cauliflower, Sweet Potato, and Queso Fresco and it was flat out awesome. I ate every single bite! The chicken is super moist (don’t hate me for saying that) and tender and all the veggies and the chickpeas are super flavorful. I rarely ever eat chickpeas (no, they are not paleo) but this meal makes me want to eat them all the time! For our second day in Austin, we started off at the gym then we decided to make it a lake day. Well, kinda. We were hoping to hop on a boat while we were there, but that didn’t happen. So instead we did the next best thing – we looked at it while drinking prosecco. First we drove out to Lake Austin and stopped by a super crappy restaurant (that’s not worth mentioning) for some fajitas and terrible margaritas. 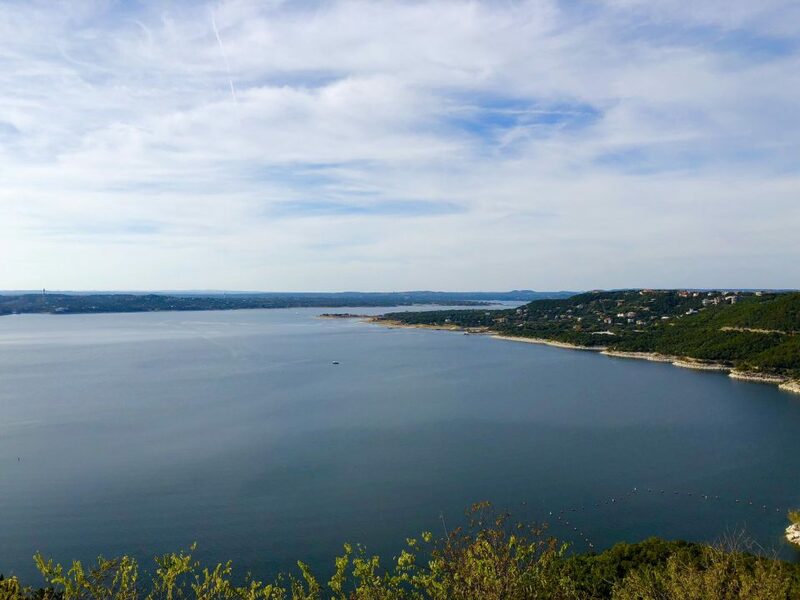 Then we drove out to Lake Travis to stop by The Oasis which is a 5 story building with incredible views and a ton of different shops, bars and restaurants to check out. Since we had just eaten sh*tty Mexican food and weren’t hungry, we simply sipped prosecco and watched the sunset. It was quite lovely, especially since it got up to 80 degrees that day! Not bad for December. For dinner that night, we went somewhere EPIC!! We met up with a friend who lives in Austin and he took us to Olamaie. Let me explain something here…if you want a fantastic meal with incredibly helpful staff, go to Olamaie. This restaurant knows what it’s doing. And in all the different times I’ve been to Austin, not once has anyone recommended this place. And I seriously don’t know how that’s possible since it was one of the best meals I’ve ever had in Austin, and maybe ever. This restaurant doesn’t specify what is gluten free so just ask before you eat, the servers there are awesome. And the drinks are just as awesome! 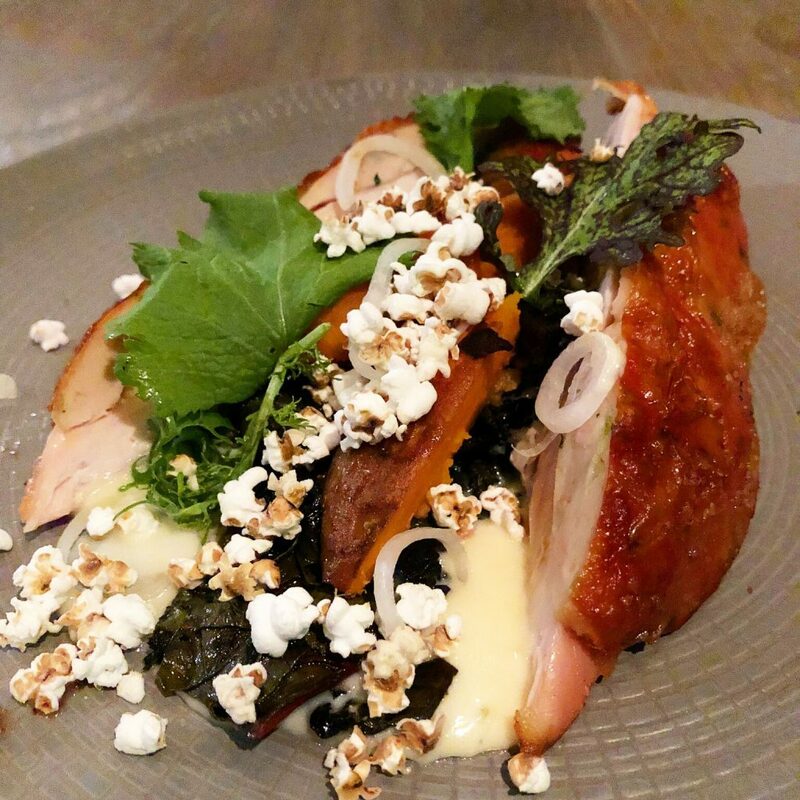 I ordered the chicken which came on top of whipped cauliflower with popcorn, sweet potatoes, and greens, and it was truly the best chicken I’ve ever eaten. Ever! Everyone should know about this restaurant because it’s phenomenal and by far the best meal I had while I was in town! The next day, we decided to split from the guys and do our own thing for a few hours. Which meant we started off at the gym again then went straight to JuiceLand. 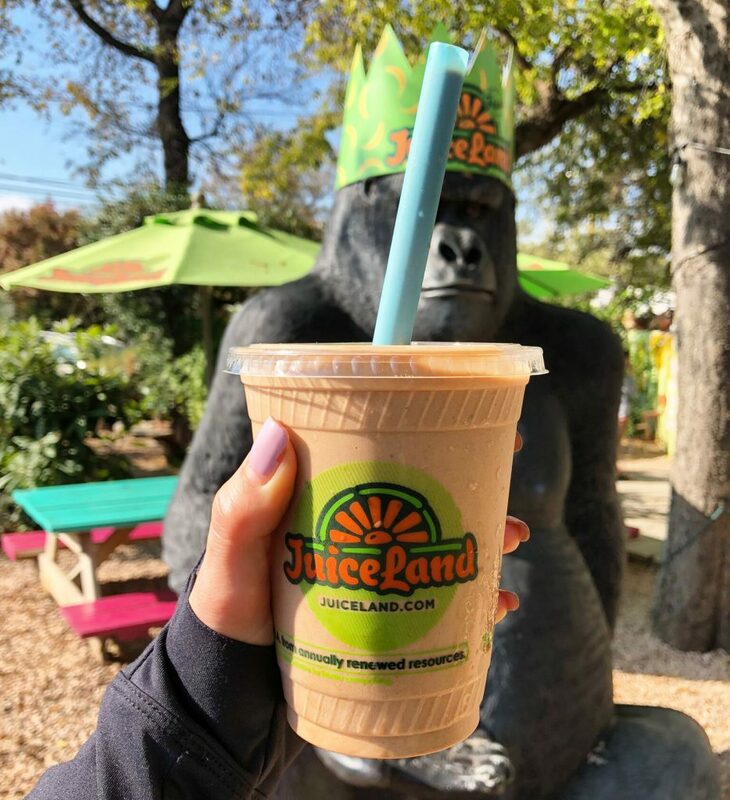 I feel like if you live in Austin, you’ve gone to JuiceLand at some point. Because they just make damn good juices. And you can add anything you want to it. Want to add aloe so you’re a slippery slope when your next bathroom time calls? They’ll do it. Want a cold pressed juice because cold pressed is so much damn better? They go it. Want a wheatgrass shot because you want to have a terrible day? They’ll support you. They have protein smoothies, green smoothies, hot drinks and they even have food. They do it all. And the location we went to had a giant gorilla out front. Random, but I dig it. I ordered the percolator which has almond milk, banana, cold brew coffee concentrate, cacao powder, and cinnamon and I added peanut butter. So delicious! After a day of shopping and stopping by True Food for a huge bowl of veggies as an afternoon snack since you ALWAYS need more veggies while on vacation, we met back up with the guys for an early dinner at Uchi. Uchi is a restaurant that fills up fasts and books out months ahead of time so we got there right at 5pm as doors opened and there were already so many people waiting inside. Luckily we were able to get a table in minutes then made dinner super easy by asking our server to pick items from the menu and we would tell him when to stop. What I like about Uchi is that dishes come out incredibly fast. So even though the plates are super small, you get one after the other so you never get bored. SO many people have recommended and told me about Uchi so I had high hopes. And even though I thought some of the dishes were amazing, I wasn’t overly impressed for the price. We have two sushi/Asian fusion restaurants in Denver (and I’ve been to a couple in Portland) that have blown me away so I expected to be amazed and only was by a couple of the dishes. I hate to be a d*ck and put down a restaurant that is CRUSHING IT and still amazing, I’m just not sure going the choosewhateveryouwantserver route was the best route. I definitely want to try it again with someone who has been there before and knows what to pick! 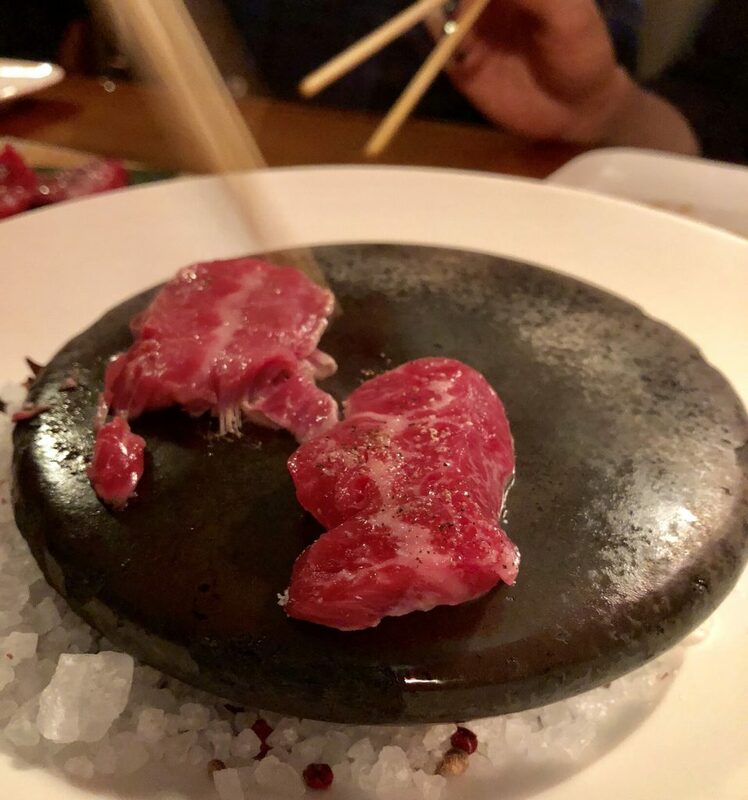 A couple of my favorite dishes included the wagyu beef that you cook at your table on a hot salted stone and the brussels sprouts that were SO flavorful and extra crispy. 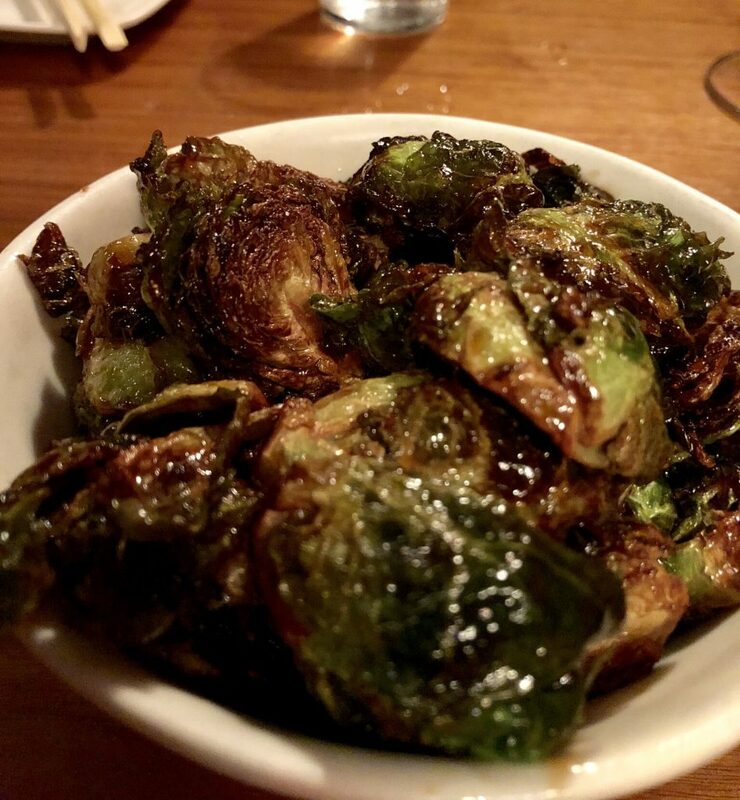 Soggy brussels sprouts should be a crime. 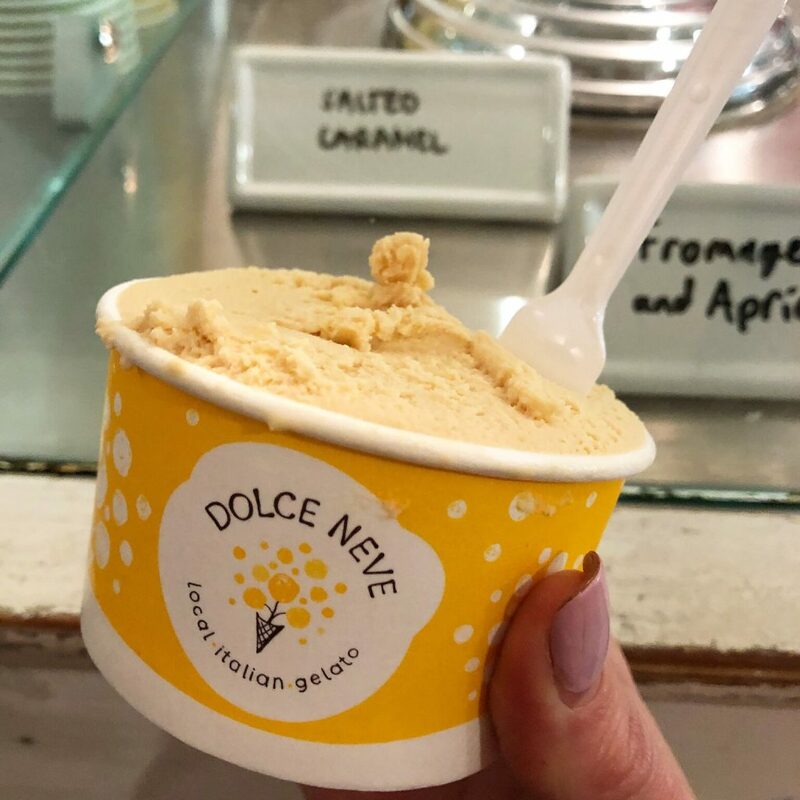 After our dinner that didn’t exactly fill the guys up (remember Uchi is small plates so don’t go hungry if you like to eat A LOT), we went to one of my favorite treat places in town – Dolce Neve. This gelato place has never ever disappointed…until this last time. I always get their salted caramel gelato after trying every single flavor and it’s usually the smoothest and creamiest gelato I’ve ever tasted, but this time it was pretty lackluster. It must have been on off night, but none of the flavors were super exciting and I was so sad because it was another place I was so pumped to share with my husband because I have so many great memories there from past trips. I hope it was a fluke because I love that place so much! While we were in Austin, we made sure to keep up with our normal fitness routines. And since trying new gyms in cities is so damn fun, we stopped in at two different gyms while we were there. First we stopped in at one of my favorites – Crush Fitness. I’ve been to this gym probably 4 times now and try to stop in every time I’m in town because I know I’ll always get a great workout, friendly staff, and a cold towel after my workout. Their gym has a treadmill section and a floor section and when we stopped in, it was an arm day that had my shoulders screaming! And for our second day, we tried out a completely new gym that I had never heard of – Align. And Align is hands down the #1 reason I cannot wait to go back to Austin. It was truly one of the most beautiful and amazing gyms I’ve ever been to. At Align they offer pilates, yoga, barre and boxing and I tried out a boxing class. It was honestly one of the best group fitness classes I’ve ever done. The coach named Morgan was so incredibly knowledgable and helpful. She wrapped our hands first and we were able to borrow gloves to punch the heavy bags with. The workout starts with a fun warmup then Morgan would run us through different combos of jab, cross, hook and upper cut. Then she finished the workout with a little ab circuit. I left smiling ear to ear, completely drenched in sweat. Then woke up sore in places I’ve never been sore. I seriously want to move to Austin just so I can join this gym. It was so damn awesome! See my fun boomerang video in the studio here! To end the trip, I took my husband to ANOTHER one of my favorite restaurants – 24 Diner and guess what…I was so disappointed!!! Nooooooo. I swear I don’t just have a bad attitude. Maybe restaurants just change over time and you can’t expect the same from them, but I so want to! Because I’ve always adored 24 Diner and it’s often the first restaurant I go to when I get into town! But this time was a total bummer. The server was straight up mean and the food was pretty crappy. I refuse to accept that this restaurant changed so I’m hoping next time I go I have a smiling serve and another awesome meal to make up for this one. I sound like such a Negative Nancy in this post and I apologize for being a Debby Downer and any other old grumpy name you can think of, I just wanted to share the full experience instead of the fluffy version. I’m definitely not known for my fluffy attitude. Anywho, I wanted to share some of the looks of different things I packed in my suitcase in case you missed them on instagram! This bodysuit and high waisted jeans have become part of my weekly wardrobe because they fit so well! The jeans run pretty big (I went down 2 sizes) so definitely keep that in mind! These jeans below are another pair that fit amazing, but definitely run big. I went down 2 sizes in these as well! But what I love about these is they don’t lose their shape throughout the day! And this cold shoulder top is a great travel day shirt. I was so comfortable even after waking up at 4am and flying by 7am. Here’s links to all the clothes I packed with me to Austin! Just click on photo to be brought to link! In the end, Austin is still one of my favorite places and I can’t wait to go back and hopefully spend most of my time on a lake and in Align in a boxing class. And I think I need to find some hidden gem restaurants because my go-to favorites just aren’t cutting it. Any recommendations?! Travel / My Recent Trip to Austin and the #1 Reason I Can’t Wait to go Back! Next time you are in Austin you need to go to Cafe No Se and Waltons Fancy & Staple! I just came back from Austin as well and both were AMAZING! never heard of those! adding them to my list! thanks so much! I recently went to Austin for a work trip and although I didn’t get to try too many places, I did enjoy most of the ones I went to. I stayed downtown so I mainly just hit up places that were walking distance between my hotel and the convention center. I tried Austin Ale House for brunch which I thought was really good, I’d definitely go back there. Then I went to Cedar Door twice, once for a work event that they catered, and once for lunch with coworkers. It was really close to the convention center so it made it an easy stop. I thought the food was pretty good there, but it was a quick stop so I didn’t look far on the menu past the brussels sprout salad I ordered. The only other place I remember is Torchy’s Tacos which I thought was good, but don’t really feel the need to try it again. Hopefully next time you’ll have a better food experience! i still have never been!! i definitely need to make it over there at some point! I would definitely recommend checking out The Guild the next time you come to town! They are apartments that are specifically rented out like a short-term rental or hotel, but in some really great apartment buildings. And there are some awesome locations all over town. awesome!! 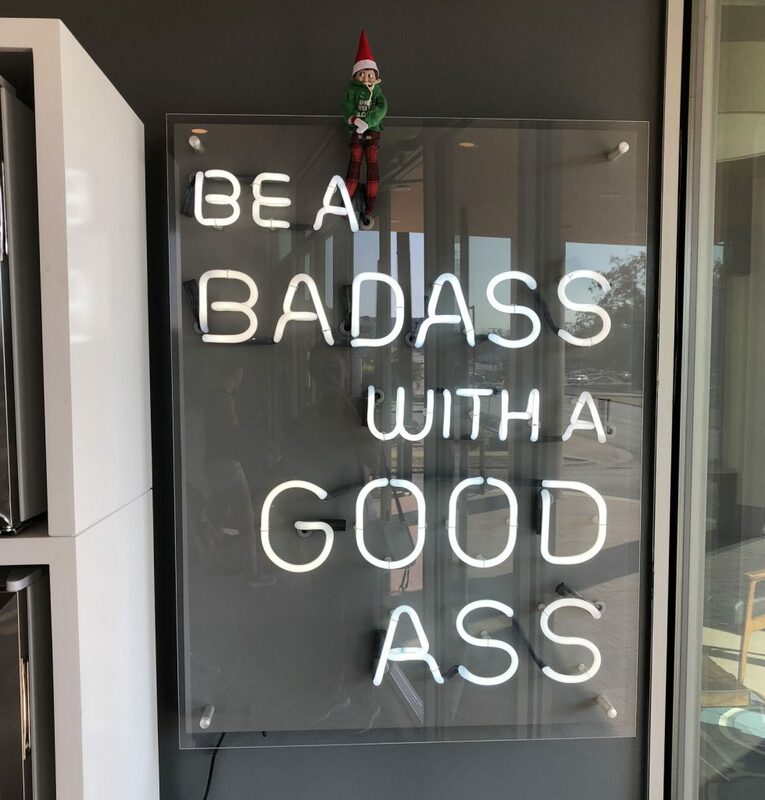 i’ll have to check that out! Koriente is a must if you like Korean food! They make it so easy to eat gf and they have a gf menu. Highly recommend the mix mix bowl (bi bim bap) and the vegetable plate you can wrap with seaweed. In my opinion best food in Austin (especially for the price). damn i love korean food!! i’m so bummed i didn’t know about this place before! awesome!! thanks for the recommendations! The location of your condo was as walkable as it gets; Austin’s just not a walkable city. Next time you’re in town check out Cenote for lunch — it’s the cutest little cafe and their salads are BOMB. Launderette is really good for dinner too. our uber driver recommended launderette! i wish i could have tried it! All pictures especially with you are just fantastic. Great place, delicious food and beautiful you. As an Austinite, I’m bummed you’re experience at 24dinner wasn’t good! But I was excited to read about all your positive encounters! I love uchi too and I started eating at picnik after I saw you mention it in a previous blog. I LOVE hearing about all your travels! Hey Juli! I’ve lived in Austin 4 years and J feel you- a few places I started out loving have slid downhill. The good news is, there are tons of amazing options (like Olamaie) and new ones opening up all the time. Current top of my reco list: Pitchfork Pretty, Kemuri Tatsu-ya (such a fun atmosphere too), Mattie’s, gluten free pizza from Via 313, Tacodeli (I’m sure you’ve been but if not, it’s a must)… there’s more where that came from but that’s a decent start. And you’re right – the lake is totally the move. Don’t bother with the food at The Oasis. Great view, mediocre food. Drinks there for the view at sunset is what people in the area do. I live in Austin! Definitely check out Contigo and/or Chicon! Damn amazing food! Flower Child in the Domain is our current usual spot, gluten friendly and super healthy but the flavor is THE BOMB. Come back! Austin loves you! i love flower child! we tried going to one downtown for some veggies but it wasn’t open yet! i went to the flower child in the domain once and it was literally the worst chicken i had ever tasted. i never send my food back and everyone tried it and forced me to. so so weird because that place is usually awesome! Mongers is great for seafood. Odd Duck is my absolute favorite restaurant in Austin. Farm to table and everything I have tried, I loved. me too!! i’ve only been there for brunch and need to try it out for dinner! I’m a huge fan of 24 Diner and Dolce Neve too, so that’s a bummer you didn’t have an awesome experience. I’ve been in Austin 3.5 years and haven’t tried Olamaie so excited to put it in the list. And I’ve been really digging Bonhomie recently – you should check it out next time you are in town! it’s the best! you’re going to love it! The Salty Sow is one of my go-to places on the very rare occasion we eat out. Girl, you need to try Jacoby’s and Grizzeldas! They are right up your alley and do not disappoint. I’d love to have you here in Asheville, NC. I own http://www.innerstrenghasheville.com, and we have the http://www.arxfit.com machines as well as a clearlight infrared sauna and a bulletproof vibration plate. There are a million and one other fitness studios around us as well. And, Curate, NightBell, Posana, Chestnut, Corner Kitchen, Biscuit Head, Over Easy Cafe, and a bunch of others, are stellar for food. I just moved here but I’m liking it. 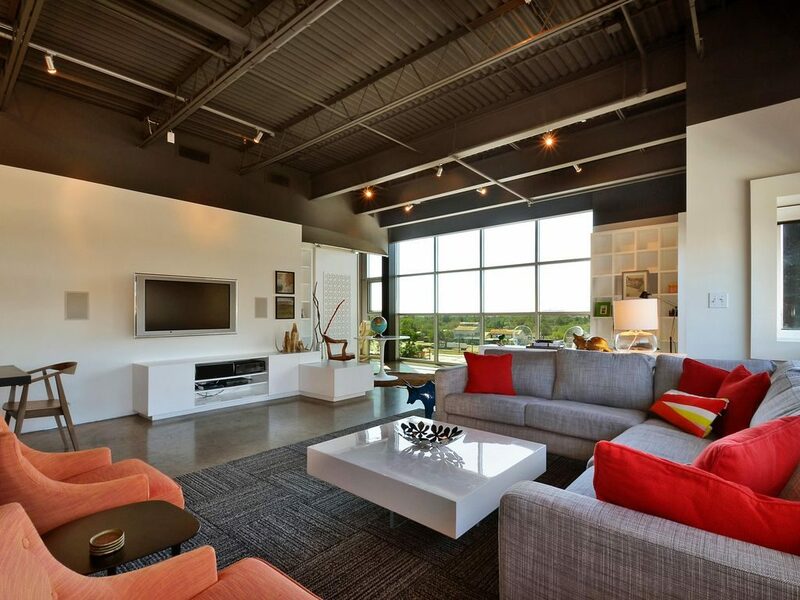 I’m also considering Austin for my next move….are you planning on staying there in CO? Thanks so much for all you do :). Hi Juli. I am in Austin for work and went to True Food Kitchen last night for dinner. AH-MAZE-ING and great service. The weather was beautiful, hustling bustling ambiance, which might not suit everyone (but was fine for us). Then we walked across the courtyard to Trader Joe’s to pick up healthy snacks to keep at our hotel for the week. This California girl had a successful Day 1 in Austin. Thanks for the recommendation! These suggestions are great, and I’m glad that you didn’t sugarcoat your reviews of your favorites. 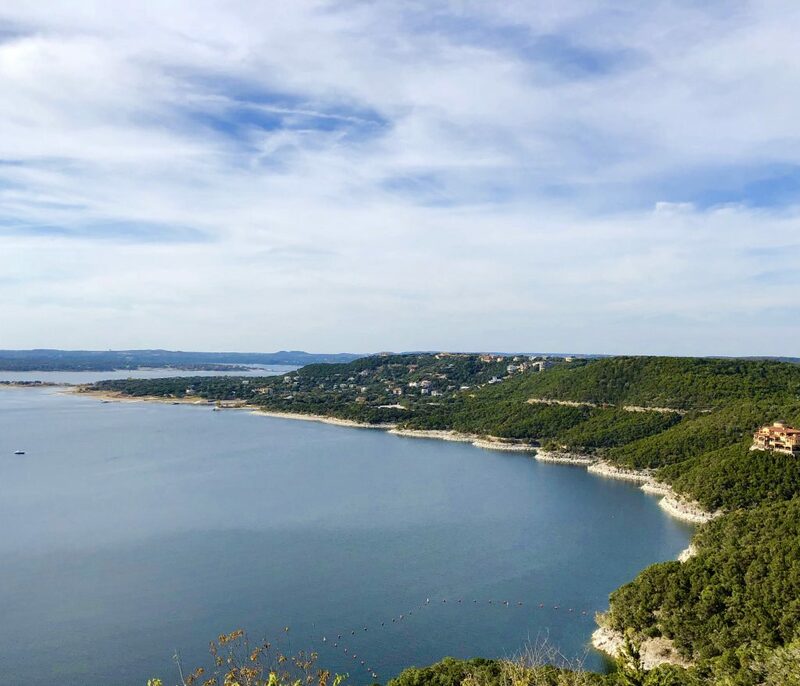 Husband and I are going camping in Austin in a couple weeks, so I made a list of your best recommendations- we can’t wait! Thanks again!